Larry Krasner, the most progressive candidate in Philadelphia’s seven-way Democratic primary election for District Attorney, won the race Tuesday in what supporters call “a revolution.” Krasner ran on an unprecedented campaign to end mass incarceration and stand up for people’s civil rights and liberties. A civil rights and criminal defense attorney, Krasner told The Intercept that “the criminal justice system systemically picks on poor people, and those people, at least in Philadelphia, are overwhelmingly black and brown people.” During his career, Krasner has sued the Philadelphia Police Department no less than 75 times. 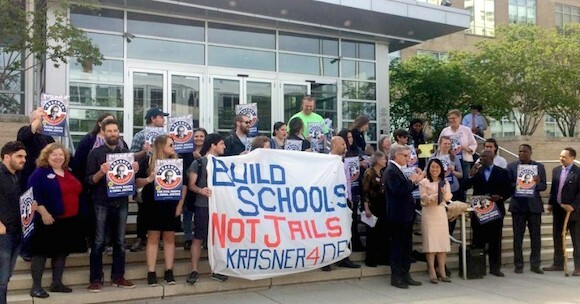 Krasner campaigned for DA with promises to end cash bail and not to lock up non-violent arrestees who don’t pose a threat to their communities. He has also pledged “to never seek capital punishment while working to end bail policies that lock up people for being poor, an asset-forfeiture program that has been a national disgrace, and stop-and-frisk searches that disproportionately target non-whites,” observed local op-ed columnist Will Bunch for philly.com. Krasner’s stances are indeed revolutionary in Philadelphia, where district attorneys and city politicians have made careers with “tough on crime” policies, stepping up criminal prosecutions, and consistently advocating for the death penalty. As the nation faces a frightening return to “tough on crime” policies under right-wing Attorney General Jeff Sessions, civil rights advocates outside of Philadelphia also celebrated. “This changes the game across the country,” said William Cobb, deputy director of the American Civil Liberties Union’s “Smart Justice Campaign,” to Philadelphia Magazine. Krasner will face Republican Beth Grossman in November, but his primary victory is seen as a de facto win for the office in the very Democratic-leaning city.